RPM at evolgen has started a series of articles on publishing original research on blogs. He's going to tell us about the aldolase genes in Drosophila melangogaster. I'm sure he's going to be explaining some interesting studies about the evolution of the two aldolase genes so I urge you to pay attention. Here are the three postings so far. I hope he won't mind if I describe some of the biochemistry of the aldolase catalyzed reaction and the pathways where aldolase is involved. I don't think RPM is going to do any more than what he briefly described in Part 2. The first point I want to make is that aldolase is a type of enzyme that forms and cleaves carbon-carbon bonds. There are many different types of aldolases with different substrates and products. The most common of these enzymes is fructose 1,6-bisphosphate aldolase. Because it's so common it is often just called "aldolase." All of the the other aldolases must be specified in order to avoid confusion. 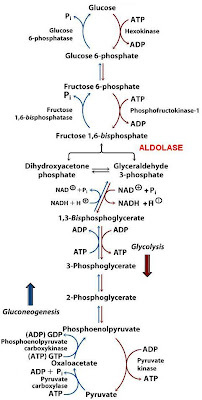 There are two different kinds of aldolases (i.e., the fructose 1,6-bisphosphate kinds). Class I enzymes (left, above) are only found in plants and animals. Class II enzymes (right, above) are usually found in bacteria, protists, and fungi. Many species of plants and animals have both types of enzyme. The two different types of aldolase are completely unrelated. They have different structures and sequences even though they catalyze the same reaction. I think the two Drosophila aldolase genes that RPM is discussing both encode Class I aldolases. Aldolase is one of the most important enzymes in the pathway known as gluconeogenesis (glucose biosynthesis). In this pathway two molecules of the 3-carbon compound pyruvate [Pyruvate] are eventually converted to one molecule of the 6-carbon compound glucose. The gluconeogenesis pathway reads from bottom to top in the figure on the left. One of the key steps in this pathway is the joining of two 3-carbon molecules to make a single 6-carbon molecule. That's the step catalyzed by aldolase. The substrates are glyceraldehyde 3-phosphate and dihydroxyacetone phosphate and the product is fructose 1,6-bisphosphate. All species can synthesize glucose 6-phosphate using this pathway. It is clearly one of the most ancient pathways in cells. Early on in the history of life—once glucose molecules began to accumulate in the biosphere—there was a need to convert them back to pyruvate and recover the energy that had been used to synthesize glucose in the first place. In most species this pathway was the Entner-Douderoff pathway, a pathway related to the pentose phosphate pathway. It involves another type of aldolase called KDPG aldolase that joins glyceraldehyde 3-phosphate directly to pyruvate. Somewhat later, new enzymes arose that could get around the difficult steps in gluconeogeneis. These are shown as separated red arrows in the figure. This new pathway is called glycolysis and it represents a more direct "reversal" of gluconeogenesis. All eukaryotes, and most bacteria have the glycolysis pathway. They are capable of converting glucose to pyruvate using a few specialized enzymes and most of the same enzymes used in gluconeogenesis. Notice that the enzymes, substrates and products of the core part of the pathway (from fructose 1,6-bisphosphate to phosphoenolpyruvate) are identical in glycolysis and gluconeogenesis (parallel red and blue arrows). What this means is that flux in this part of the pathway can flow in either direction depending on the state of the cell. This includes the aldolase reaction. Gluconeogenesis is usually more important than glycolysis. In order to appreciate this, think about plants. They make all of their glucose from carbon dioxide so the only glucose that can be broken down is the glucose that the plants make themselves. It follows that more glucose is synthesized than is broken down by glycolysis. This is true of bacteria, protists and fungi. The situation in animals is a little different since glucose is an important food source. It's possible that the overall flux in this pathway favors glucose breakdown although even in animals there is considerable glucose synthesis going on. The bottom line is that aldolase is mainly required for gluconeogenesis and only in animals, and some specialized species (like yeast), is glycolysis more important. In older biochemistry textbooks the emphasis was on glycolysis and not gluconeogenesis. This is because the more classical biochemistry tended to focus on mammalian fuel metabolism (rat liver biochemistry) where glycolysis was important and glucoenogenesis was not. The mammal-centric form of teaching ignored the evolutionary history of metabolism and it's importance in other species.